You have spent a lot of money for your equipment, now consider protecting it. Protection does not get much better than a Pelican 1620 Hard Case. "It is made of Ultra High Impact structural copolymer that makes it strong and durable. Its exclusive 1/4" (6.4 mm) neoprene o-ring and ABS latches seal perfectly and includes an automatic purge valve for quick equalization after changes in atmospheric pressure. It is equipped with 2" (5 cm) hard rubber transport wheels, a retractable extension handle and multiple fold down carrying handles. Your equipment can fit into the high density foam or padded dividers for total subjection and protection against impact, vibration or shock. This case is tested to MIL C-4150J (Military Standard). You break it, we replace it... forever." Stories abound about how these cases hold up to abuse. They are simply tough. The Pelican 1620 Hard Case is even rated (by Pelican) to float in salt water with a 150 lb load and is waterproof to 30'. I must admit I did not attempt to prove these facts with the $15,000 or so of equipment pictured below. Pictured in the 1620 above are the following ... A Canon EOS-1D Mark II Digital SLR with a Canon EF 24-70mm f/2.8 L Lens in a Lowepro Toploader 75 AW Case (front/left). A Canon EF 70-200mm f/2.8 L IS Lens in a Lowepro Lens Case 4 (back/left). A Canon EF 180mm f/3.5 L Macro Lens and a Canon EF 100-400mm f/4.5-5.6 L IS Lens in their Canon lens cases (back/center). A pair of Canon Flashes in a Lowepro Pouch 50 AW (top/right). A Canon EF 70-200mm f/4 L Lens in a Lowepro Lens Case 2 (center/top/left). A Canon EF 50mm f/1.4 Lens stacked on a Canon 1.4x Extender - both in Lowepro Lens Case 1s cases (center/top/left). A Canon EF 85mm f/1.2 L Lens and a Canon EF 135mm f/2 L Lens in Lowepro Lens Case 4s cases (center/bottom/right). And a Dell Latitude laptop computer (front/right). The Lowepro Toploader 75 AW Case will not fit with a lens longer than the Canon EF 24-70mm f/2.8 L Lens with its hood in place on a pro body. The case gets compressed slightly when the lid is closed. Without going to extremes, I make a serious effort to keep my name out of the insurance companies' shared claims database. Transporting my equipment in the Pelican 1620 Hard Case lowers my risk. The 1620 is available with no foam, with "Pluck-N-Pick" foam or with padded dividers. I selected the padded dividers but do not use them exactly as designed. When the 1620 with padded dividers arrives, individual compartments are ready to accept bare lenses, camera bodies and other equipment. I chose to make my own compartments and use my padded cases in them. Using individual padded cases inside the padded 1620 increases my protection and increases my flexibility when I arrive at a location. 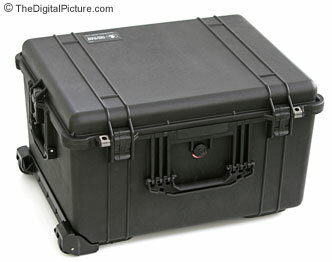 The Pelican 1620 Hard Case's inside dimensions are 22-1/16" x 17" x 12-9/16". If you get a padded version, subtract about 1" from the foam in the lid and an additional 1/2" from the bottom for the padded divider version. The foam version loses space in the bottom, but the amount varies greatly with your personal configuration. The 1620's outside dimensions are 24-13/16" x 19-3/8" x 13-7/8". The case weighs 22 lbs empty. Pack your valuable equipment in a Pelican 1620 Hard Case and the chances of damaged equipment arriving at your destination should be reduced.